Remember this heartening, creamy dessert from your childhood? Cinnamon, apples and pears add a distinctive fruity flavor. It might take some time to prepare, but it is worth the wait. 1. In heavy medium saucepan, bring milk, rice, cinnamon sticks and salt to simmer. Reduce heat to low. 2. Cover and gently simmer until rice is very tender and milk is almost absorbed, stirring occasionally (about 1 hour). 3. Add sugar, vanilla and nutmeg and stir to blend over low heat until mixture is very thick (about 15 minutes). Remove cinnamon sticks. 4. 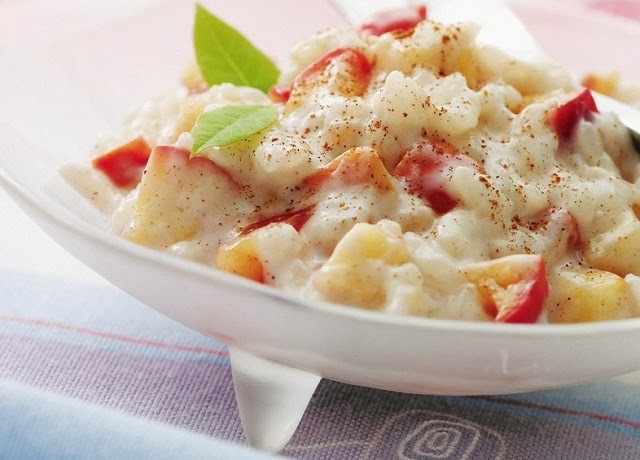 Stir yogurt and ¾ of fruit into rice pudding. Transfer to large bowl. Top with remaining fruit and sprinkle with ground cinnamon, if desired.